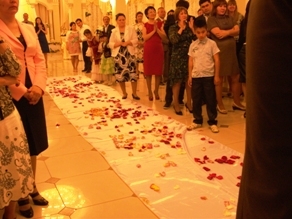 Kazakh weddings are similar in some ways to British weddings... the bride’s long white dress, involvement of a best man, flowers, mountains of food. But speaking from modest experience the Central Asian variety seem to be more extravagant, go on for a lot longer, and involve a lot more people, doing a lot more things. 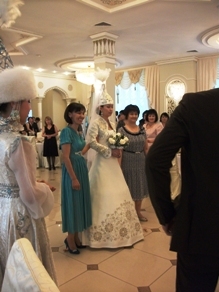 My former student and very good friend tied the knot with her fiance in early June 2011 in an Astana restaurant clearly very experienced in the delivery of what we in Britain might call ‘a bit of a do’, which in layman’s terms is a deliberate understatement for a swinging party. 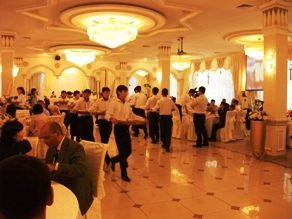 The six hour celebration did not let the side down, with over a hundred guests enjoying great food, company and entertainment, the latter in the form of an excellent host, professional singers and dancers, and including performances from two great dombraists. 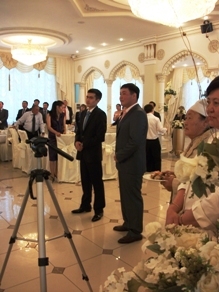 Kazakh weddings are a bit like communicative classroom activities, they involve all participants, and instead of speeches being limited to a simple two or three people, everybody there has chance to toast the newly weds in their own way. Four or five toasts, then dancing, singing, music, and then more toasts. This day was not for me, it was for them, the nicest family in the world, I don’t think I can state that enough. But it will also be a lasting special memory for myself as I was reminded once more how wonderful this country is, by over a hundred people whose affection for my toast, given in Kazakh, and my dombra recital was thoroughly heart-warming. 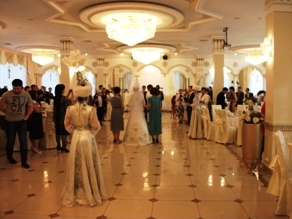 It took quite some courage to play the national instrument of Kazakhstan in front of people who’ve grown up hearing it played better, but what of it, as long as Kazakhstanis are prepared to share their country with me am I prepared to make the effort to value what it is we love about life here. 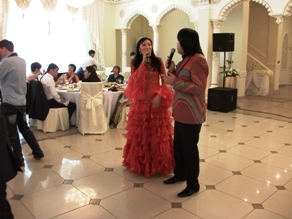 Kurmangazy’s Balkaimak is a famous melody, and its performance last Saturday was my gift of appreciation to a very special couple.